Facebook has disclosed that it believes that up to 87 million people may have had their data improperly shared with political consultancy Cambridge Analytica. That's far more than previously believed with whistleblower Christopher Wylie earlier putting the number at approximately 50 million. Commenting on the situation, Mark Zuckerberg said that "clearly we should have done more and we will going forward". The Facebook boss also said that he previously assumed that when Facebook provided people with tools, it was their own responsibility about how to use them". He has now said that holding such a view was "wrong in retrospect". The following infographic is based on Facebook's blog post where it acknowledged just many users may have been compromised. It is important to note that the company doesn't know precisely what data was shared or exactly how many people were impacted so the figures serve as its best estimate. 81.6 percent of the estimated 87 million people impacted are likely to be in the United States. That could mean that 70.6 million Americans have had their data compromised. 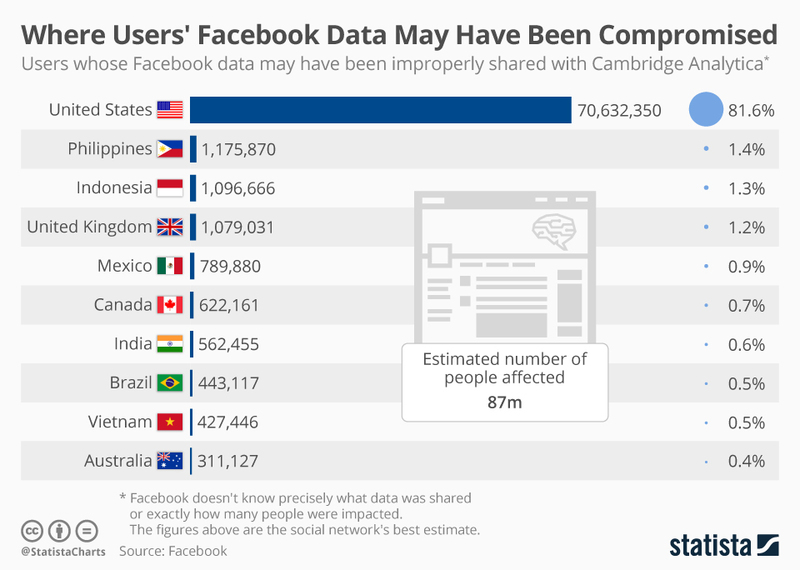 Other countries on Facebook's list include The Philippines, Indonesia and the UK, all of whom could have over a million compromised users.